Heavy Sterling Silver Toggle clasp w/ Pearl bar-ends. 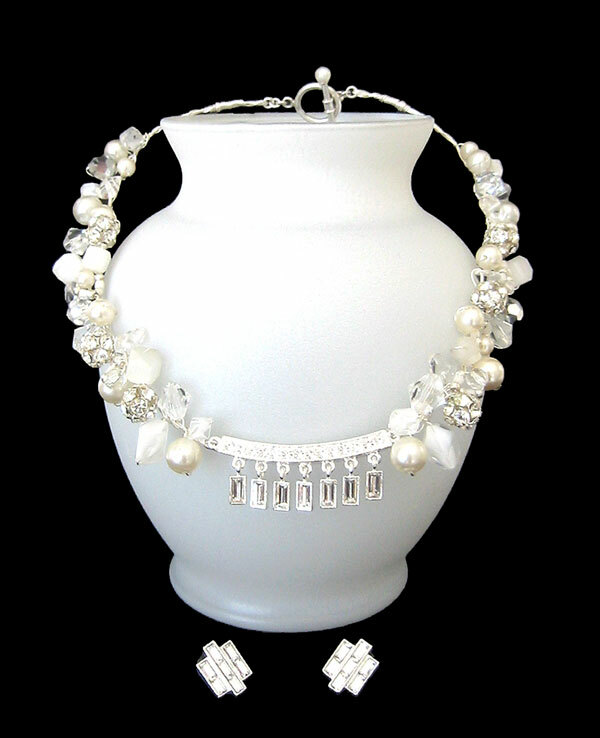 Gorgeous signed vintage "Napier" deco-style centerpiece w/7 dangling baguettes and 14 round Rhinestones. Lovely matching vintage & signed "Napier" deco-style pierced earrings. Rare vintage Japanese glass rhomboid shapes w/white inclusions (2 lge, 4 sm). Vintage Japanese Satin glass cubes w/faceted corners (3 lge, 2 med, 1 sm). Vintage Swarovski Rhinestone 'balls' (6). Unusual vintage cut crystal bi-cones (5). Vintage Crystals w/silver coating (4). Vintage "Laguna" glass Faux Pearls. Small vintage Czech glass crystals.